From editing the book The Romance of the Three Kingdoms, to making podcast series False Art History, to developing digital program Art Parameter, artist GAO Jié’s works seemed to be produced from a publishing house with the consciousness of contemporary business management. What’s bizarre about this publishing house is that the person in charge for planning, editing, proofreading and marketing is the same one, even the author that contributes the articles. By using this way of an almost parodical “internal publication”, the artist keeps externalizing the self into the public sphere, and becomes a people’s publishing house of only one person. 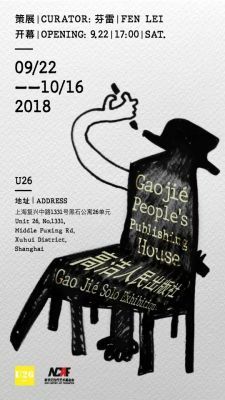 In the title of “GAO Jié People’s Publishing House”, “GAO Jié” refers to a person as well as some existence, which is always implicated with the most inner part that cannot be represented, and the minority that cannot be enframed (Gestell). Based on so and so, the work and its demonstration can be used to interpret each process of self-discovering, self-writing, self-editing, self-censoring, self-amending and self-publishing of each individual. This series of underlying traces of production is interfering, again and again, the hermeneutical meaning of the contemporary subject of the territory of the technologies of the self. 4. Each ‘framework’ is the progress of a test, through which he can get an unknown result(The result can be known by finishing art tests). GAO Jié’s representative works - False Art History podcast series is released on all leading audio platforms and has been a continuous project for over two yeas, including images and texts that amounts to hundred thousand words, and directly makes the knowledge tool for understanding contemporary art into artistic creation; Art Parameter, an internet application that reviews artworks, an ongoing project for over ten years and now in it’s sixth version, discusses the understanding of artworks and the language that we use for communication; Art4A.I. 1.0 the mobile game: it is art that is made for A.I. to appreciate; The World is over ten yeas, including the series of Define A Concept; The Romance of the Three Kingdoms explores the questions of linguistic structure. Main solo exhibitions including Art4A.I., Bannister Gallery, University of Rhode Island, US (2017). The World, Tang Contemporary Art, Beijing, China (2014). Put Your Seed In Your Own Garden, A2Z art gallery, Paris, France (2013). You Are Inside My Head, A2Z art gallery, Paris, France (2012). FEN Lei，One of the founders of Pulsasir, co-founder of Récit Film and partner of the book publishing brand “Paideia”. Curated “Récit Film Week” (Hangzhou, 2014), “Guy Debord Film Week” (Hangzhou, 2015), “Symposium in Memory of Roland Barthes’ 100th Anniversary” (Shanghai, 2015); and co-curated “Write Everything: Re-recognize social texts and artistic practices” (2016.6 - 2016.8), the city project of the 11th Shanghai Biennial “Grain God Narrative” (2016.10), and the “Gazetteer-Novel: A Joint Writing Exhibition of the Village Residency” (Beshan, Anhui Province, 2018) and etc..